The Westfield Carousel $350m Redevelopment project is reaching its final stages, with three quarters of the work complete. Under the very capable and experienced hands of our client, Scentre Group, this project is set to deliver a redefined retail, dining and social destination in Perth’s south east. At Finesse Consulting, we successfully recruited, and staffed, majority of the Carousel project group, including roles such as Project Managers, Contract Administrators, Supervisors and Estimators. 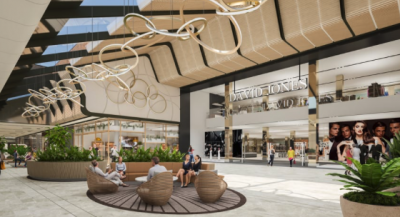 Scentre Group states this redevelopment will offer the following, “A new David Jones department store, more than 60 additional speciality retail outlets as well as a new fashion precedent, and a landscape rooftop dining and entertainment quarter.” This project is on track for completion in late 2018. It’s an exciting time for Scentre Group with upcoming projects at Westfield Booragoon, and Innaloo commencing mid this year. Finesse Consulting will be commencing recruitment for these projects soon – we encourage anyone interested in becoming involved to register your interest with us today.